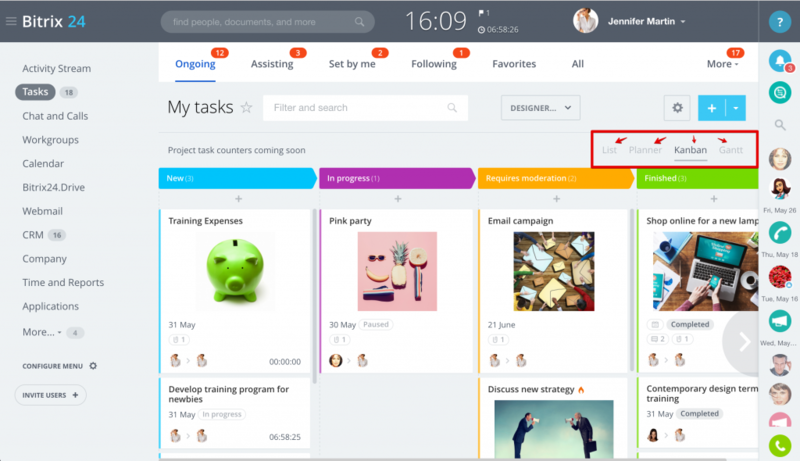 Switch between available tasks views: simple List, Kanban boards, Planner or Gantt Chart. set task parameter as Show Tasks I Don't Participate In. Department head has access to subordinates tasks only. All other users have access to own tasks or tasks they are involved in. 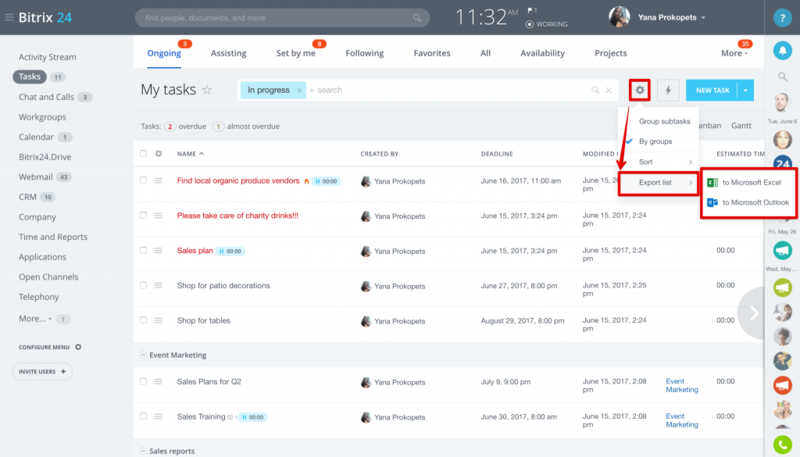 To navigate between tasks details inside task list view you can scroll page either horizontally or vertically. To change column sorting click on column name. To change columns order simply drag & drop column name. 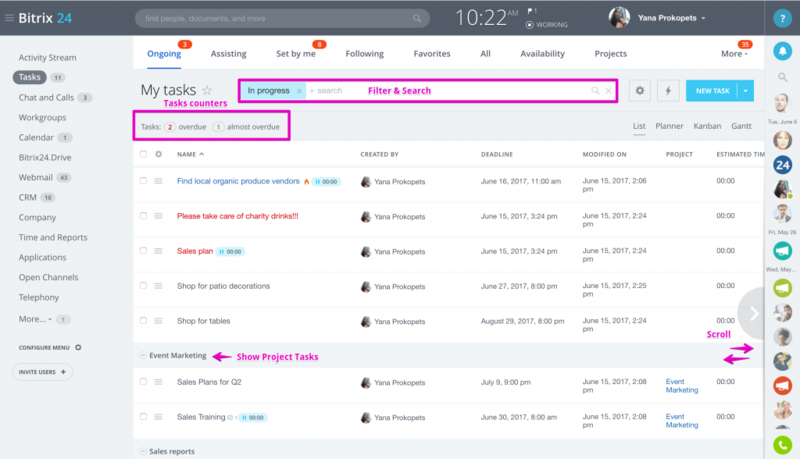 The List View Setting page shows all available tasks details that you can add or remove from the Task List columns. Use Apply for all users option to save List view configuration for all account users. Quick access filters: placed on the left side, such as Completed, Deferred, Overdue, etc. You can pin any of the default filters (task filter will be applied to list automatically each time you open tasks), or add your own filter to the left panel (configure filter conditions & apply Save Filter option). Filter conditions: placed on the right side. To add more conditions to filter click on Add field below the conditions list & enable\disable task conditions (fields). Filter settings: allows to reorder (drag & drop) quick access filters & filter conditions fields, pin, edit or delete filter, Apply for all users - save filter configuration for all account users. You can use both filter & search keyword together to achieve best search results. Click on the settings icon next to the task name to open task options menu: view, edit, create subtask, finish, pause, defer, etc. If you need to apply an action to a group of tasks, select tasks or use For All option (located below the the task list) - to apply it to all tasks (take into account active filter conditions above) & open Select Action menu below the list. Choose action & click Apply. Read more here. Tasks list can be exported to Excel or Outlook. Click on Settings icon in the right corner above the list & find Export List option. Task export includes only tasks details, tasks discussions will not be exported. Task import is not currently supported. 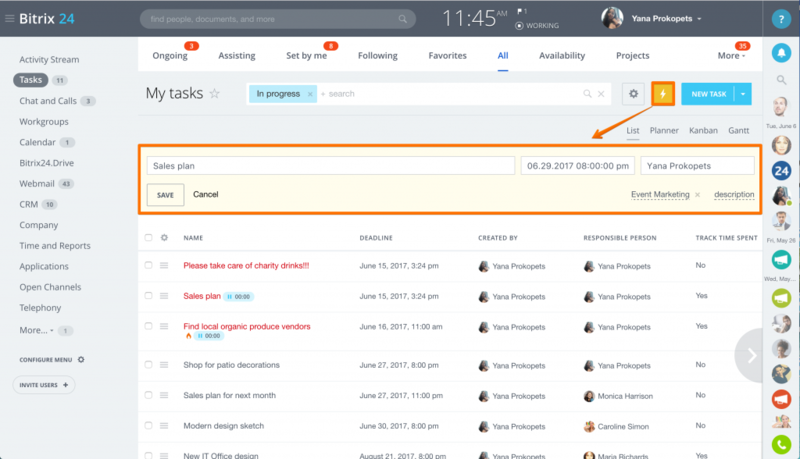 This means you can create a template for a task which you plan to reuse it future. If you work with recurring tasks here is when the templates comes in handy: you can create a template for a task & make it repeat within a set frequency (daily, monthly, etc.). 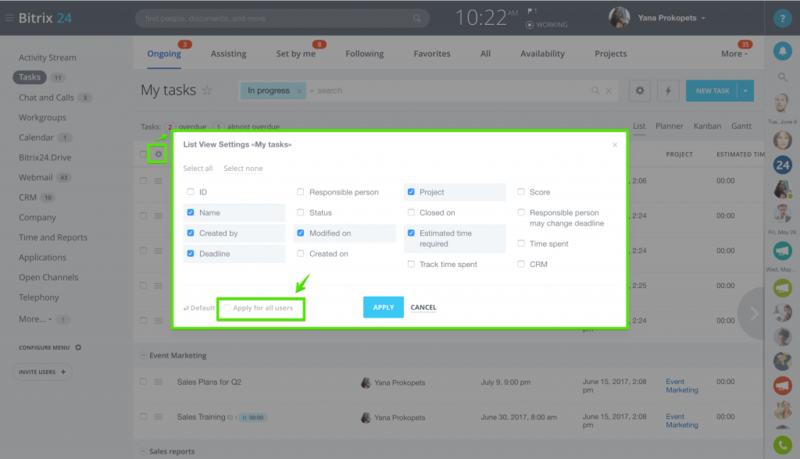 Task with subtasks templates are available as well. Read more about how to work with tasks templates here. There are four roles in tasks: Responsible person, Created by, Participants, Observers. Responsible person - person who will work on a task and will be responsible for its implementation. Created by - person who has created the task. Also, this user confirms that the task is finished. Participants - users that can help the Responsible person to finish the task if it's needed. They can perform the same actions as the responsible person. Observers - users that can observe the work on the task, leave comments, get notifications, but can't participate in the work on this task.